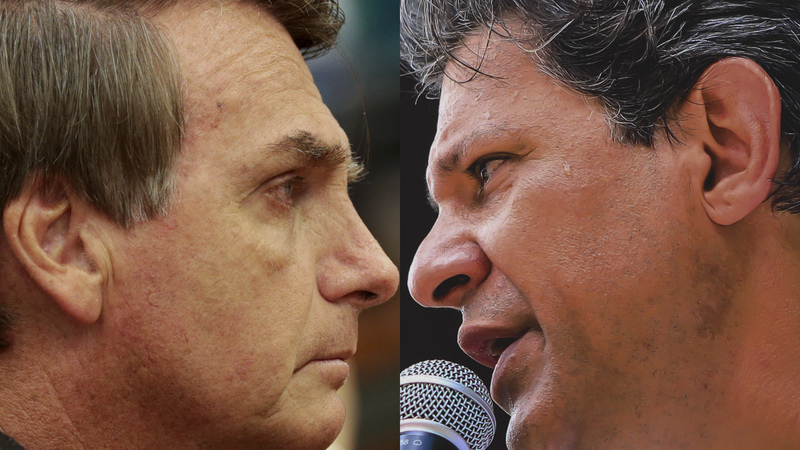 The latest Datafolha poll shows Bolsonaro has 39 percent of the votes; Haddad has 25 percent, Ciro appears with thirteen percent, Alckmin with nine percent and Marina with four percent. RIO DE JANEIRO, BRAZIL – On the same day as the final presidential debate (Thursday, October 4th), Datafolha released new research of voter intentions showing Bolsonaro with an increasing lead. Voting in Brazil is set to take place on October 7th, and if the fifty percent threshold is not met by any candidate, a second round is held on October 28th. The latest Datafolha poll shows Bolsonaro has 39 percent of the votes; Haddad has 25 percent, Ciro appears with thirteen percent, Alckmin with nine percent and Marina with four percent, photo internet recreation. As of yesterday Jair Bolsonaro (PSL) appears with 39 percent of the voter intention in the presidential race. Fernando Haddad (PT) has 25 percent and Ciro Gomes (PDT), thirteen percent Geraldo Alckmin (PSDB) is nine percent and Marina Silva (Rede) has four percent of voter intentions. João Amoêdo (Novo) marks three percent. Henrique Meirelles (MDB) and Alvaro Dias (Podemos) have two percent. Cape Daciolo (Patriot) and Guilherme Boulos (PSOL), one percent. Vera Lúcia (PSTU), João Goulart Filho (PPL) and Eymael (DC) did not score. The survey counted 10,930 voters in 389 counties between October 3rd and 4th. The margin of error is two percentage points, plus or minus. The research was contracted by TV Globo and Folha de S. Paulo newspaper and registered in the Electoral Justice (BR-02581/2018). Regarding rejection of the candidates, Jair Bolsonaro is indicated by 45 percent of the voters who declared that they would not vote “in no way” in the candidate in the first round. Haddad’s rejection is forty percent, while Marina’s rejection is 28 percent. The rejection rate of Geraldo Alckmin is 24 percent and that of Ciro Gomes, 21 percent. Henrique Meirelles have a rejection rate of 15 percent. Cape Daciolo and Boulos are rejected by fourteen percent of the voters heard. Vera Lúcia and Alvaro Dias were thirteen percent rejected. Eymael, twelve percent; Amôedo, eleven percent, and João Goulart Filho, eleven percent.